EMTS data show biomass-based diesel volumes associated with D4 RIN generation in January and February approached 265 million gallons, surpassing last year's volumes when the credit was in effect. Of that, more than 82 million gallons was imported. March 21 represents the end of the 60-day freeze period on new regulations pending review, implemented by the incoming U.S. administration Jan. 20. While EPA has been radio silent, stakeholders welcome implementation of RVOs finalized last November. 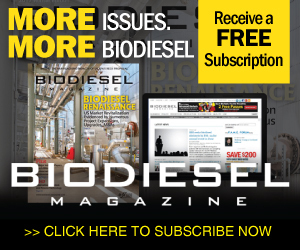 The Sustainable Biodiesel Alliance has announced the certification of Oregon-based SeQuential, the longest-running commercial biodiesel producer on the West Coast, for its innovative and nearly zero-waste production of renewable fuel. Canada-based biodiesel producer Biox is exploring co-locating a renewable diesel production facility next to the 50 MMly biodiesel plant it purchased from Methes Energies last year in Sombra, Ontario. Biox is working with Forge Hydrocarbons Corp. The Minnesota Soybean Growers Association and the Minnesota Soybean Research & Promotion Council hosted a gathering of people at the Minnesota Soybean office March 15 to celebrate the 15th anniversary of the passing of Minnesota's biodiesel mandate. The biodiesel industry honors Rudolf Diesel, inventor of the diesel engine, by naming his birthday, March 18, National Biodiesel Day. This year the National Biodiesel Board highlights five individuals from this great American manufacturing sector. Germany's biodiesel quality management association (AGQM) and the mineral oil and fuels standards committee have begun registration for their annual round robin test for biodiesel and rapeseed oil fuel for 2017. Registration is open until April 7. Conestoga Energy Holdings acquired the assets of VicNRG, a marketing, distribution and terminal operating company for biodiesel. The investment gives Conestoga Energy the opportunity to be a midstream provider of biodiesel marketing and logistics. A demonstration by an Iowa farm cooperative aims to convince more farmers in the state to use biodiesel. United Farmers Cooperative, based in Afton, Iowa, put two trucks head-to-head to compare how B5 and B20 blends performed. The B20 truck won. Experts from California and all over the U.S. gathered in Sacramento in March to discuss biodiesel in the Golden State. The one-day event, the California Biodiesel Alliance's sixth annual show, addressed challenges and highlighted opportunities. DSM Nutritional Products and Evonik Nutrition & Care will each hold a 50 percent share in the joint venture and co-own the $200 million production facility, which will be built at an existing site of Evonik and is expected to come on stream in 2019. The ASA recognized Joe Jobe from Jefferson City, Missouri, with its Special Meritorious Service Award at its annual awards banquet during the 2017 Commodity Classic in San Antonio, Texas. Jobe led the National Biodiesel Board for nearly 20 years. U.S. EPA has granted Genscape Inc. an extension to respond to the agency's Jan. 4 notice of intent to revoke the company's ability to verify RINs as a third-party auditor under the RFS QAP. The company now has until April 18 to respond to EPA.